It wasn’t all that long ago when, if I wanted to see Dr. Feelgood all I needed to do was walk out of the house, ride a cab to Dingwall’s, find a comfortable section of a bar to lean against and watch the band over the heads of the small but bouncing crowd. Those days, for better or for worse, have gone for ever. To see the band on this particular occasion, one of the stops on their current UK mini tour, involved a taxi to Euston, a train ride to Manchester, and an overnight stay at the Midland Hotel. Times have changed, the band have changed and the audiences have very definitely changed. We arrived at the Midland just in time for Star Trek. This particular episode was all about a hideous, rocklike, alien thingy using Kirk, Spock, Genghis Khan and a bunch of other unlikely persons to stage a symbolic battle between good and evil. We (boy photographer Chalkie Davies and myself) stayed in our rooms long enough to watch the eventual triumph of good, then we headed down to the hotel bar. Lee Brilleaux, Chris Fenwick, the Doctor’s manager and mentor, and Jake Jakeman, the band’s tour manager, were already there for a pre-gig drink. I hadn’t seen Lee since the Feelgoods completed their two rapid-fire tours of the USA. He looked a little tired, decidedly thinner, but otherwise in energetic, if tense, good health. After the handshakes, drink ordering and the other social convention ice-breakers, the obvious first subject was how the band had fared on their first wanderings in the promised land. It had been the rough and tumble of second billing and opening shows for big names : what has become the toughening up process for any British act seeking to make the jump from domestic to international reputation. The days of swarming into a top line US tour on the strength of a British hit and a powerful grapevine are something else that have become little more than a memory. Today the British have to break into the land of the free the hard way, just like everyone else. Tough as it may have been, the consensus of opinion seems to be that the whole exercise came out ahead on points, even though at times the Americans had a certain amount of trouble figuring out exactly what the band were all about. We may be deluged by US cop shows, but the Yanks see damn few of ours. Thus there is a certain cultural block to prevent them fully coming to grips with the familiar East End gangster macho that we all know and love. The closest American teens have come to the like of Brilleaux’s stage visual is probably James Fox in "Performance". Their brand of high energy nouveau British R & B has, however, a much more universal appeal, and the band seem to have won through on that level in most places they played. On a more personal level the band, with the sole exception of Wilko Johnson, took to the USA like happy tourists. Wilko seems to have had some difficulty coming to grips with the American way and, by all accounts, including his own, spent a lot of his free time on the first tour watching mindless TV. Second time around, however, he felt better equipped to handle it and Johnson/US relations have improved to some degree. The rest of the band had no such reservations. They had fun. Fun is very high on the Dr. Feelgood list of priorities (but more of this later). Brilleaux tells stories of going to Berry Park (Chuck’s famed amusement centre in St. Louis) which, unfortunately, didn’t come up to expectation, and seeing Jimmy Reed (who did) in a small, sweaty club in Texas. "We thought we might have some trouble with rednecks in Texas but, in fact, everyone was great. We had a great time all through the South." The current problem seems to be that after the furious pace of touring, Brilleaux in particular is not a hundred per cent sure how he’s going to pass the time now they have a break from the road. The subject of free time off leads automatically to the subject of when-are-we-going-to-see-a-new-album ? The response is soon, but nothing is going to be rushed out to fill any mythical schedule. The Feelgoods, to a man, think in terms of music rather than product. The current idea is to experiment with putt-ing down tracks in Sparko’s front room studio. This appears to be phase one of a philosophy that deems the big, thirty two track, Flash Gordon studios - held so dear by the likes of Queen - too technically and emotionally unwieldy to produce the kind of neo-Chess sound that Dr. Feelgood are apparently aiming for. The Figure’s description of chez Sparko is graphic. "He wanders around with a glass of Scotch in one hand wondering where he can plug inthe wires." IT’S SHOW TIME. Every- thing stops in the bar, and we make our way the couple of blocks to the Free Trade Hall. The backstage bar is something of a pub rock school of ’75 reunion. There’s Martin Stone, Nick Lowe and even our lofty, lovable Tony Tyler,-the last in Manchester to conspire with the Albertos. The reunion is long and busy. The first signal that the band have taken the stage is a full throated roar from the main body of the hall. The legros scatter from the bar to their various vantage points. Okay, first the good news. Two American tours have honed Feelgood down to a fine scalpel edge. The entire set is conducted at a full stretch gallop. Not that it was ever sedate, but instead of relying on individual inspiration, the act has been refined to a precision cavalry charge that builds in power along the time space with high pro dynamics. Now, more than ever before, the band look important. Even though the show hasn’t been radically changed since l saw them last October, the amount of work that has been put into it makes it come out fresh and exciting. Brilleaux, above others, has made great, strides forward. His stage presence now extends right to the back of the hall. He uses the limits of the stage with far greater authority. His harmonica playing has moved from the Jagger/Daltrey school of the-singer- blowin’-a-spot-of-harp into a musical entity in its own right. Over and above all this, though, Brilleaux works himself to death. When there’s nothing else to do, he determinedly humps the drums. 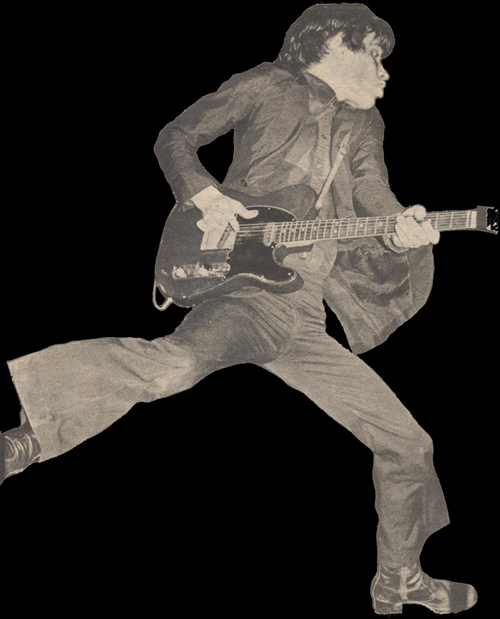 At the climax, when Wilko is bounding in the air like Sylvester after sitting on a red hot rivet, Lee is flat on the stage performing violently pornographic pushups. Sparko too has stepped into the light. Where once he tended to idle at the midpoint between amps and footlights, he now works nonstop, making a third unit in the moving tableau with Lee and Wilko. The Big Figure, as ever, provides the menacing, bedrock power unit that stops the entire thing winding itself into a chaos of energy. Wilko Johnson, of course, has never needed any urging to step up to the footlights. Progressing from stages the size of a kitchen table to festival spreads bigger than some of the clubs they first played in, he has always used every possible inch. Now he not only uses them, but embroiders them with frills, fills and fancy side steps. Not only is he the square-eyed psychotic with the Telecaster, but tricky with it. His playing is starting to soar and his presentation is taking on the demi-star charisma of seasoned professional, without y falling into the rut of thin gimmicky trouper. There is one problem, however. That chunka-chunka rhythm that arrived with "Roxette", and has been with the majority of Feelgood originals ever since, could start to be their downfall. There’s a danger of it becoming a 'sound', a commodity that the punters start to demand, the Feelgood noise, on a par with Hawkwind’s space gale or Quo’s heads down lumbering boogie. For a while, providing a sound can be an easy niche, except that it usually stifles musical progress and blocks the band from ever getting past the top of the second division. Moreover, there is only a finite time until the fans on it and start drifting to pastures new. AND THAT brings us squarely to the audience. Ape is a much over-used word. The trouble is that it fits so aptly. The audience for Dr. Feelgood that night went stone ape. .
lt was like a 1964 Stones cinema tour except for two actors. 1) The squirming, pushing mob in front of the stage was ninety per cent male. 2) Nobody actually wanted to get on to the stage. Lt was just that everyone in the stalls wanted to be in the front row, by any means possible. Wave after wave of bodies projected themselves forward. Walking over heads, shoulders, anything that got in the way, the front of the crowd reared up into a vast human pile. At almost every move from the band, clenched fists and straining arms reached out fury it like an amoeba reaching for its dinner. It was as though this throng, maddened by a kind of ; Reichian energy hunger, were beseeching the band to direct the orgone stream right at them. It would all have been jolly fun except that somewhere under the heap were hard, angular, dangerous things known as seats. Despite constant and lucidly direct exhortations from Wilko to ease back, the craziness started to take its toll. A face would go blank, a head would loll and roadies would have to plunge forward to drag any unconscious figure from the crush. One small boy with long blond hair solved the problem by crawling in among the monitors. He couldn’t have been more than twelve but he exactly judged the spot where he’d neither get crushed nor thrown off and also have the finest view in the house. Maybe he’ll grow up to be Max Bell. On top of the pile a bare torsoed youth with a wiry afro, looking uncommonly like a young Murray, and a neanderthal in a woolly hat, beat rhythmically on their brothers below. In the comparative safety of the gallery, two girls, one in the tight red forties dress, and the other in a red fifties blouse and black pencil skirt danced in time together like whores at a revival meeting. The hall just wasn’t planned with any-concept of the energy and excitement it was being forced to contain. At the after show booze-up (They had rented a pub on a council estate. Could this be memories of old Canvey or subtle anti-chic ?) I talked to a disturbed Wilko Johnson. "lt was upsetting, all those kids at the front. It was the first time I‘ve had to stop myself going all the way, to hold back, in case someone got injured. I‘ve been in situations like that myself, at demonstrations. It’s when the crowd gets so tight you can’t even get your lungs to work. You feel yourself blacking out and you start to panic. I don’t want to be involved in anything like that. I don’t want to have some kid on my conscience. It just isn’t worth it. If it came to that I think I‘d jack the whole thing in. It wouldn’t be fun if people were getting hurt because of us." Chris Fenwick amplified the same sentiments. "I don’t know what the answer is. You could have massive crush barriers which cut everyone off from the stage, or you could do what they do in America : have cops patrolling the aisles keeping everyone in their seats. Neither of those solutions is acceptable." One thing is sure, it’s a problem that won’t go away. Not for Dr. Feelgood, not for dozens of other bands. Promoters can’t expect name bands to pull punches and play at half throttle because they’re being presented in an unsuitable location. At the far end of the chain, the people who rent the venues also have to come to terms with the increasingly important rock audience. A lot of money is made out of live rock. It scarcely seems unfair to expect some moves to 'adapt the existing venues to provide a somewhat more tailored environment in which to enjoy the music. With that thought in mind, I proceeded to get drunk.